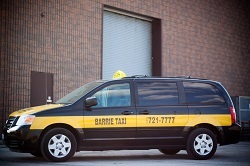 Barrie Taxi Ltd. was founded in 1990 and built on one key concept; taking PRIDE in every RIDE. Our pride is displayed in every aspect of your ride which begins the moment your call to 705-721-7777 is answered with the pleasant greeting of our call taker. It continues to be reflected in the prompt dispatch of the vehicle, the courteous, professional and safe driver, the clean and safe condition of the vehicle and is maintained beyond your safe arrival at the destination, with convenient in-car payment options, accurate and specialized account billing services, and timely responses to lost and found and other customer queries. We are proud to serve the City of Barrie and its surrounding area with the safest, most reliable transportation for passengers and parcels. To help serve you better, Barrie Taxi Ltd. introduced our computerized dispatch system. The system optimizes the use of our vehicles, providing our customers with minimal wait times and a quiet, relaxing ride thanks to the absence of constant two-way radio chatter that is found in other taxis. Thanks to the hard work and professionalism of our dedicated and loyal staff, Barrie Taxi Ltd. is the largest taxi service provider in the Barrie area. 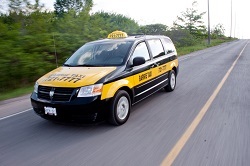 Since its inception, Barrie Taxi Ltd. has provided over 10 million rides.